Our Trap is highly effective research based scientifically designed which is Design Patent Protected. Easy to assemble and hook in every farm fields. Easy in maintenance for removal of dead flies. Container can hold 5400 Dead flies. This product is a pest fly trap, which should be used with pheromones lure to attract and trap pests of the Bactrocera cucurbitae species of 226 sub species (commonly known as Melon Fly), which is a major pest of high risk which causes pre-harvest damages, and this pest cannot be controlled by any pesticide. Commercial crops: Sun Flower, Maize. 3. The flies entered directly has to hit the lure block and will fall down. 4. Also for better performance even after the trap box is filled by the flies, and the warmness of the cap will hit the lure so that the pheromone is constantly released. Specific yellow color is used for cap; this yellow shade in particular is optimized which is a visually alluring shade for the pests for better attraction. Ultraviolet light has the simultaneous influence of oxygen on plastic causing photo oxidation - leading to considerably damage un-stabilized thermoplastic resins. Depending on the polymer decrease of optical, mechanical and physical properties leads to loss of surface shine, surface rips, de-chalking, yellowing, discoloration, embrittlement, deterioration of the mechanics, etc. UV Proofing with multi-functional group, big molecular weight of each and every trap components gives stability against oxygen, light, heat resistant, extraction resistant, low volatile which helps in retention of transparency, delay surface degradation, which provides prolonged field longevity thereby providing farmers to re- use of traps for upto 3 seasons and weather resistance product enabling the product stable and sturdy at all weather temperatures. The trap container is designed in an Umbrella shape for avoiding the rain water enter into the trap even tilted at 45 degree angle, so that there is no dilution or degradation of the pheromone. Guarding against rain wash out of pheromone as lure is placed at the top of trap. 1. 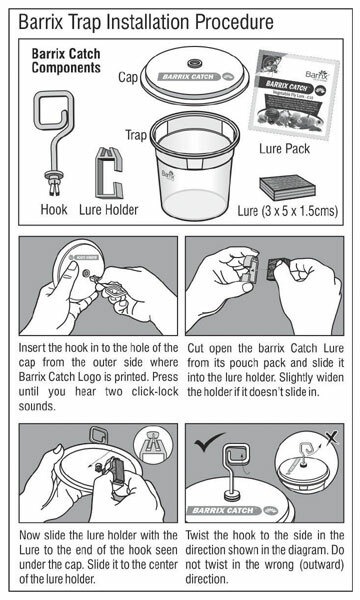 Fix the Barrix Trap as shown in the diagram below. 2. Hang at 3 to 5 ft from the ground level preferably under the shade after fixing the Barrix Catch Vegetable Fly Lure specially made for this trap. 3. Make sure fixed lure doesn't oscillate and fall down by the wind. 4. After 15 days of trap placement add 1-2 drops of pesticides like Malathion / DDVP to the lure using an ink filler to reactivate the trap. 5. For prolonged harvest replace the Barrix Catch Vegetable fly Lure piece once for every 45 days. 6. Remove flies and lure form trap box and bury it one feet below the ground or burn it. 7. This can be even used at pre-harvest period for securing the yield.